I still have one, mostly driven by my wife. I would probably have one too if they hadn't got so ridiculously expensive. I still think they are the best car I have driven in over 60 years of motoring, certainly the most reliable. I now have an equally old C220 Cdi Merc estate, its nice but I still feel more at home in the 406. Mine has been the biggest piece of sh*t I've ever owned, I hated it from the moment I got it. 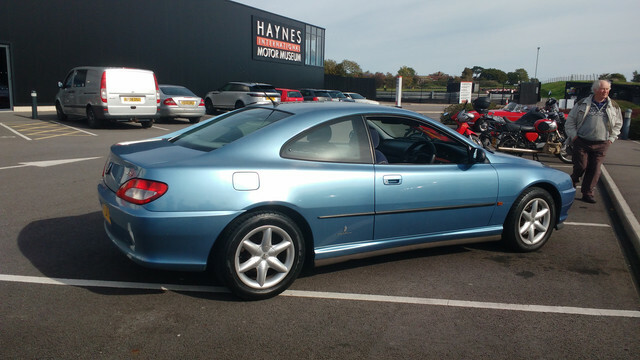 Never wanted to drive it any distance as I didn't trust it, it always felt like it was hanging on by the skin of its teeth even though it was relatively low mileage full service history and well looked after. That's some, uh, interesting parking! ...and I thought BMW drivers were bad! well sort these out too. I've still got mine at 164k,bought an 11 plate 2.2 Mondeo estate to replace it but keep finding excuses to keep it. I've still got mine at 224k having run it since October 2012 / 87k. Has to be about the most reliable car I've ever owned, but suspect it's not going to be worth MOT-ing it at the end of March. Needs rear wheel brgs, which will require rear disks/pads/shoes/backplates bodged somehow, brake servo's on the way out, a few drop links, alternator pulley's getting noisy, slight unidentified coolant loss, the list goes on. It's getting kinda tired looking, headlining's started to droop in places, no prospect of repairing the aircon, will need tyres / 4-wheel alignment soon too. I've done the essentials to keep it going, (cambelt, oil, filters, battery in the last few months), but common sense tells me I'd be better off putting the money towards a replacement than fixing this one. My fault for letting these jobs pile up, but I've been busy with other stuff and something had to give. The first set of recon injectors I got for it were from Euro Car parts, and one failed after 6 months, and it never felt 'right' with them in. I got another recon set from Darwen Diesels at £125 each, and they have been flawless. Engine still feels smooth as silk, can't complain about these ones at all! A few cold one's & look at all the other pugs + hill climb action. This is sad news but I completely understand how this happens, you know if the 'car' fails to achieve an MOT then your engine and gearbox combo has gotta be worth £££ to someone 'in the know' especially with your environmentally ethical modifications* (EEM). Of course the reality of separating these things for sale and parting with the remaining carcass will be a PITA as I'm sure you know. I've just checked up on my old 406, it finally failed an MOT in March 2015 and hasn't been presented again, it made it to 16 years old on the road with only 158K miles. My HDi 110 was a nuisance to be honest, constant fear of stuff going wrong, lots of spurious Check Engine Lights, unbeknown to me the car had been used by the previous keeper for International Caravan Towing (all over that France etc) I think this took its toll on the engine mounts which then chewed up the eggsauce flexi (requiring a new CAT) and tore through an Intercooler Hose, also had the radiator fan crap out, various sussy failures, EGR failure, bottom pulley failure, lift pump failure, a/c condenser(s), eggsauce snappage. As Peter said though the 406 was a lovely familiar thing to flop into after a days work. MOT on my 406 expired Feb 17 so I guess it's a gonner. Although, frankly, I'd worn it out. Still happy with the 407 (which is now on 190k, bought Oct 13 at 74k). It's asking for a third flywheel and I think it's going to get a solid on this time. And if that kills it then I'll be shopping for a 406. I was kinda glad to get rid of the 540i, as that was not the best. Rubber bits dying everywhere - engine mounts, coolant hoses, watercooled alternator seals, suspension gaiters, pneumatic suspensions bits... It was pretty unreliable tbh with a list of things wrong with it and I really didn't dig the grey interior anyway. I had to MOT the Merc a couple of months ago. When he told me 'yep no problems', I didn't know what to do - I've never actually had that happen before! Even before that, it's actually the first car I've ever driven outside the country without feeling the need to take a full tool bag, breaker bar and axle stands with me! Literally the only thing wrong with it, is the passenger mirror has stopped dimming! Well, there's some gripes I have with the design (184mph limiter, insistence on enabling starter-killer start-stop "eco" mode every time it's started, no steering-wheel mounted 'next track' button, bad headrest), but just the mirror that's actually broken. Although having said that, I might have let the battery get a bit dead over xmas. Possibly a £300 mistake if both batteries are toast.